A quadriplegic man who had been living in an assisted living facility dies of aspiration pneumonia, which is both natural and is a known complication of quadriplegia. However, the manner of death in this case should be based not on the pneumonia (the immediate cause of death) but on the event that caused the man to become quadriplegic in the first place. If he was quadriplegic due to a non-traumatic myelopathy, the manner remains natural. However, if he was quadriplegic from a gunshot wound to the neck, the manner of death becomes a homicide, because the gunshot wound set in motion the chain of events that ultimately lead to the man getting the pneumonia. The following image is from the autopsy of a young boy who suddenly collapsed and died during a walk with his family. 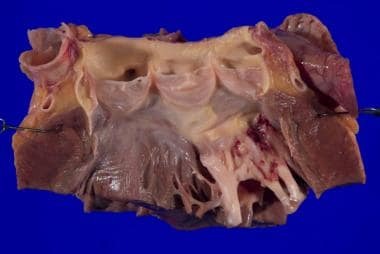 Cardiomegaly (220 g) and symmetric left ventricular hypertrophy from the autopsy of a 6-year-old boy who suddenly collapsed while on a walk with his family. These findings are consistent with symmetric hypertrophic cardiomyopathy. Other autopsy findings included pulmonary edema and ascites, as well as hypertensive changes in the lungs and early cardiac cirrhosis. See also Autopsy Request Process, The Autopsy Report, Adjuncts to the Forensic Autopsy, Religions and the Autopsy, Autopsy of the Transplant Recipient, Autopsy Rate and Physician Attitudes Toward Autopsy, Universal Precautions and High-Risk Autopsies, Autopsy Quality Control Metrics, and Medicolegal Issues and the Autopsy. From the medical examiner's or death investigator's prospective, sudden (natural) death is generally viewed in a much broader sense and includes all deaths in which an adequate diagnosis of a lethal medical disease has not been reached before death, regardless of the duration of the illness. The definition of “unexpected” is somewhat more straightforward and is based more on the probability that a decedent would have died at that particular time given the individual’s medical history, or lack thereof. Unexpected deaths may occur in previously healthy individuals and in those with known natural disease when the severity of the person’s condition does not explain death. Frequently, the latter situation occurs when the primary physician does not feel the decedent’s medical problems would have likely resulted in death. Sudden unexplained death syndrome (SUDS): Sudden death in an otherwise healthy individual with no cause identified following a complete and detailed autopsy and death investigation; also known as "sudden adult death syndrome" or "sudden arrhythmogenic death syndrome" (SADS). Two men are found dead in their respective apartments. Both apartments are locked and secured, and there are no signs of foul play. One decedent is 20 years old and was previously healthy. The other decedent is 80 years old and had a history of coronary artery disease with multiple cardiac bypass grafts. The death of the 20-year-old man is significantly more suspicious and more likely to receive a complete autopsy than the older man with a history of heart disease. Another circumstance in which medical examiners routinely assume jurisdiction over a probable natural death is when there is no other physician available or willing to certify the death. Sudden natural death in all age groups can result from diseases or conditions arising in any organ system, although conditions affecting the heart, lungs, and brain are the most likely to result in truly sudden death. Before performing the autopsy, all attempts should be made to obtain and review a decedent’s past medical history in addition to any findings/information gathered by the death investigation team. The decedent’s past medical history and symptomatology before death may prove invaluable in interpreting the autopsy findings and in identifying a cause of death. A complete and thorough autopsy, including external and internal examinations, should be performed by, or under the direct supervision of, a forensic pathologist. [3, 6] Ancillary tests for microbiology and toxicology can be collected and sent immediately or stored for future use. Depending on the age and demographics, appropriate samples should be obtained at the time of autopsy in anticipation of future studies (eg, saving material for molecular genetic testing). Consultation with specialists in forensic neuropathology and cardiovascular pathology may be necessary in certain cases. When interpreting pathologic findings and assessing their significance, it is important to keep in mind that people may die with a disease and not from the disease. The likelihood of finding atherosclerotic vessels increases with age and will be present many more times than not, especially in older individuals. One should be careful not to automatically assume that the atherosclerotic disease is the cause of death, and a diligent search for other causes should always be performed. Both natural and non-natural causes of death may have very subtle or very few findings which can be easily overlooked in the presence of other natural disease processes. [3, 7] Special attention should be paid to the neck for subtle signs of trauma such as in manual strangulation or smothering. Evidence of low-voltage electrocution may be difficult to identify. Poisoning, accidental or intentional, may require a high index of suspicion in order to collect and process the appropriate toxicology specimens, particularly if a volatile substance is suspected. Some poisonous agents, such as cyanide, can only be smelled by genetically-able individuals (the classic burnt almond smell) and thus may go unnoticed. It is also important to remember that an apparently negative autopsy is not synonymous with "no anatomic cause of death." [3, 6] Additional historical and investigative information should be sought, potentially including revisiting the death scene. Some diagnoses may eventually need to be made on the basis of exclusion, particularly when due to a functional disorder such as cardiac arrhythmia. See also The Medical Examiner and Coroner Systems. Sudden, unexpected deaths can occur in all age groups; however etiologies vary by age and, in some cases, by ethnicity. The individual’s age, personal medical history, and family history can provide valuable information in developing a differential diagnosis and in directing ancillary studies at autopsy. In most cases, deaths in infants and children are, by nature, both sudden and unexpected. Although many different types of hereditary and acquired diseases cause deaths in adults, natural deaths in children and young adults are more likely to be the result of congenital disorders, infections or malignancies. [2, 5] Cardiovascular causes of death in infants and young children are typically due to myocarditis (usually viral), various congenital diseases or syndromes with either primary or secondary involvement of the heart, or congenital heart defects. 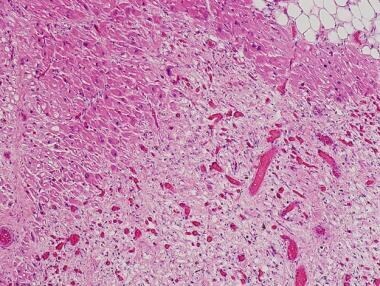 Gross autopsy findings may be subtle (endocardial fibroelastosis, myocarditis) and may first be suspected on review of the histologic slides. Adolescents and young adults dying suddenly and unexpectedly from natural processes typically have some form of heart disease, of which hypertrophic cardiomyopathy is the most common. Many cases of congenital disease are diagnosed in utero or shortly after birth and usually do not fall under the medical examiner’s jurisdiction, however a number of congenital and hereditary conditions may remain asymptomatic, are minimally symptomatic, or are rapidly fatal and thus are thus brought to the attention of the medical examiner. Fortunately, the overall incidence of these diseases is low; therefore, they constitute a smaller number of cases requiring medicolegal investigation. In this section, causes of instantaneous or sudden death, causes of unexpected death, and autopsy-negative causes of death are reviewed primarily by organ system. Instantaneous or sudden death may result from dysfunction/abnormalities of the heart and its vessels, noncardiac vessels, pulmonary system, and central nervous system (CNS). Acute myocardial infarction, cardiac tamponade, cardiac outflow obstruction (aortic stenosis, valvular prosthesis thrombosis, atrial myxoma), and congenital heart disease are also heart conditions that can lead to instantaneous/sudden death. The scene of a natural death can provide valuable information, and it is imperative that the medical examiner be notified of any findings before the start of autopsy. Not only can the scene findings be used to arouse or refute suspicions of foul play, useful clues pertaining to natural disease processes can be obtained. It is also important to remember that, on occasion, evidence from the scene may have been moved, removed, or “cleaned up” by family members and friends. Paramedics may have moved the body or removed clothing or evidence (ie, ligatures around the neck) in an attempt to resuscitate the individual, and police officers or other emergency personnel may have altered the scene in some way for safety or access purposes. If not directly examined at the scene, any prescription bottles (and their contents) should be sent with the body, including over-the-counter (OTC) medications. Proscription medications can give important information as to the person’s medical history, provide contact information for healthcare providers, and help direct toxicology testing. Furthermore, many medications are associated with known lethal side effects, including direct toxicity, interaction with other medications and/or exacerbation of certain underling conditions (ie, potentiation of arrhythmias in persons with long QT syndrome [LQTS] or Wolff-Parkinson-White Syndrome [WPW]). Over-the-counter medications, herbal remedies and supplements should not be overlooked or disregarded as “safe.” Alone, or in combination with standard prescription medications, a number of herbal remedies and over-the-counter supplements have been shown to cause adverse events, including death. Oversight and monitoring of the quality and content of many of these products is lacking, and cases of contamination with other toxic substances have been reported. In this capacity, the medical examiner’s office may play an important role in identifying trends associated with certain products which may pose a public health risk. Is the scene in appropriate order, or does there appear to have been a struggle, effort to clean up, etc? When, and in what condition, was the decedent last seen? By whom? What condition is the body in (rigor mortis, livor mortis, decomposition, etc)? What do they appear to have been doing at the time of death (ie, sleeping, vomiting, exercising)? See also Forensic Scene Investigation. The old adage “an ounce of prevention is worth a pound of cure” governs the approach to trace evidence collection in apparent natural deaths. No specific trace evidence is associated with a natural death; however, if something questionable is identified, it is probably best to collect it so that it will be available at a later date if new information is obtained. Any potential trace evidence should be collected and processed accordingly, as in suspicious cases. As in non-natural deaths, the body and clothing should be carefully examined in order to rule out subtle signs of accidental or intentional injury. Medications, drug paraphernalia including syringes (capped or placed in special transport containers), or illicit substances should accompany the body and must be appropriately documented (type, number, additional prescription information). Examination of these items should be used to direct toxicology testing, particularly if the substance in question is not picked up on a routine drug screen (some acidic drugs, prescription drugs) or if special testing methods are required for drug isolation and identification (steroids, volatiles). See also Forensic Toxicology - Drugs and Chemicals. This section is divided by discussion of the general features of the gross external and internal examination, as well as by internal examination of the body systems most often implicated in sudden death. External examination should proceed in accordance with routine autopsy procedures. Special attention should be paid to external signs of disease, not unlike physical diagnosis in a living patient. Signs of malnutrition or dehydration may give important clues and help direct additional testing (vitreous electrolytes). Supraclavicular congestion is often seen in cases of sudden cardiac death. Findings such as fingernail clubbing and splinter hemorrhages may be seen in chronic heart disease and bacterial endocarditis, respectively. Signs of trauma, such as manual strangulation or low-voltage electrocution, may be subtle, so a detailed and thorough external examination is warranted in all cases. Organs should be examined in situ, particularly if the pathologist is not directly performing the evisceration. Any fluid present within the pleural, pericardial, and abdominal cavities should be measured and described. The position of the bowel should be examined by the pathologist before it is manipulated to determine the presence of malrotation, volvulus, or herniation. Blood in the thoracic cavities secondary to runoff from a vessel damaged in the removal of the chest plate should not be confused with true hemothoraces. Runoff may also contaminate a serous effusion. The pulmonary artery should be opened and examined for pulmonary emboli. 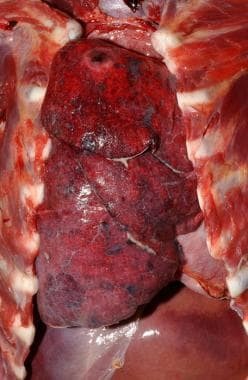 Other findings, such as hyperinflated lungs, can be readily apparent in situ but may be more difficult to identify following evisceration. Special techniques are needed to demonstrate a tension pneumothorax, which are done before the thoracic cavity has been entered (see Special Dissections). Are all organs present in normal anatomic position? Is intestinal volvulus or herniation present? The cardiovascular, pulmonary, central nervous (CNS), and gastrointestinal (GI) systems are discussed separately below. The heart should be weighed and its size and shape characteristics recorded. Determination of myocardial hypertrophy can be made using standard tables of predicted values based on body weight. If right ventricular hypertrophy is queried, the right ventricle should be removed and weighted separately; thickness of the right ventricular free wall is not an accurate representation of the degree of hypertrophy. An enlarged, globoid or flabby heart may indicate structural abnormalities such as hypertrophic or dilated cardiomyopathy, whereas a normally-sized but overly stiff heart is seen in restrictive cardiomyopathies. The origin and distribution of the coronary arteries should be noted. Acute angle takeoff of a coronary artery or other abnormalities of the coronary ostia may be the only finding in a sudden death. Other nonatherosclerotic coronary artery abnormalities associated with sudden death include location of the left main coronary artery between the aortic and pulmonary artery roots, origin from the pulmonary trunk, and tunneled coronary arteries. Other gross abnormalities can be identified, such as coronary artery dissection and rupture. The heart can be opened by a number of methods,  of which the most common is to serially section the heart from apex to approximately 2 cm from the valves. The color and consistency of the myocardium should be noted; areas of hyperemia and softening can be associated with recent infarcts, and firm, tan-white areas are associated with healed infarcts. The thickness of the right and left ventricles and interventricular septum should be measured at that level. Myocardial hypertrophy can arise from a number of causes, both congenital and acquired; the weight of the heart is a better predictor of hypertrophy than is ventricular thickness. Causes most commonly include hypertension (increased filling pressure), aortic stenosis or other causes of outflow obstruction. Left ventricular hypertrophy, in and of itself, is a risk factor for sudden cardiac death, regardless of etiology. The risk of death is increased with increasing degrees of myocardial fibrosis. Death most commonly results from disruption of electrophysiologic pathways; however, fibrosis is also associated with myocardial rupture, acquired ventriculoseptal defects, valvular dysfunction and pump failure. The pattern (symmetric, asymmetric) (see the following images) and location (septum, free wall) should be noted. This photograph demonstrates asymmetric anteroseptal myocardial hypertrophy in hypertrophic cardiomyopathy. The decedent was a healthy 17-year-old boy who collapsed shortly after finishing an obstacle course during Reserve Officers' Training Corps (ROTC) training. 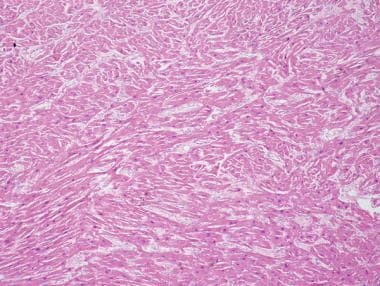 It should also be noted if the myocardial fibers appear disorganized; a "herringbone" pattern is frequently observed in hypertrophic cardiomyopathy (see the image below). Disorganization with deep fissuring of the endocardium of the left ventricular cavity is suggestive of left ventricular noncompaction (LVNC). This photomicrograph demonstrates fibrosis and myocardial disarray in hypertrophic cardiomyopathy. Right ventricular hypertrophy, as determined by the right ventricular weight, can develop secondary to pulmonary disorders (pulmonary hypertension, chronic obstructive pulmonary disease [COPD], interstitial fibrosis, bronchopulmonary shunts, chronic pulmonary emboli, bronchitis) or as a result of heart disease (left heart failure). A 53-year-old woman with a history of drug abuse was found dead in a "crack house." 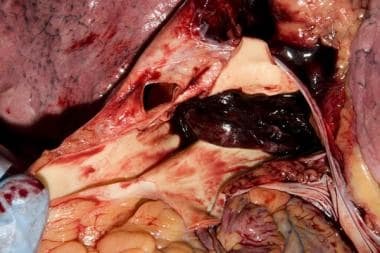 At autopsy, infarcts and microabscesses were seen in multiple organ systems, including the spleen, kidneys, and brain (including the leptomeninges). Examination of the heart revealed a destructive bacterial vegetation eroding through the mitral valve with extension into the aortic valve. There was evidence of rheumatic heart disease and extensive dental carries. Cultures from the leptomeninges grew alpha-hemolytic streptococci. The mitral valve leaflets are thickened and appear redundant in this case of moderate to severe mitral valve prolapse. A 28-year-old man with no previous medical history was found dead in bed by his wife. At autopsy, the man had pectus carinatum and arachnodactyly. Internally, he had massive hemopericardium from rupture of a large aortic root aneurysm. After their removal, the lungs should be weighed individually. Document any pleural abnormalities. The pulmonary vasculature should be opened and examined for emboli (see the image below). 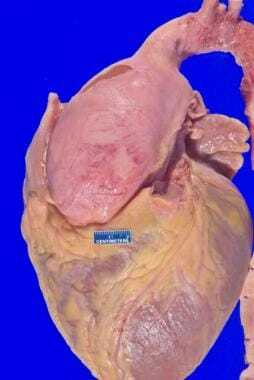 Occlusive pulmonary saddle embolus from the autopsy of a 69-year-old man who was found dead in his hotel room following a long car trip. Severe hemorrhagic pneumonia and suppurative pleuritis due to community-acquired methicillin-resistant Staphylococcus aureus (CA-MRSA), which produced the Panton-Valentine Leukocidin (PVL) toxin. This photograph is from the autopsy of a 3-year-old child who died suddenly, 2-3 days after developing an upper respiratory infection. Other family members had been sick with similar symptoms, but all had recovered in a few days. Pulmonary infarcts, usually due to systemic emboli, are more commonly seen in the lower lobes and in older individuals (who have a greater incidence of heart and lung disease, which decreases their ability to compensate for the hypoperfusion); the infarcts are raised, hyperemic, wedge-shaped areas arising at the periphery of the lung. Secondary tuberculosis may have multiple caseous lesions, cavities, empyema, military dissemination, or bronchopneumonia; erosion into a vessel may cause massive hemorrhage with rapid exsanguination. A thorough examination of the CNS is very important to the investigation of sudden death. The scalp is reflected to expose the calvarium, which is then removed to expose the dura covering the brain. The scapular soft tissue and galea should be examined for hemorrhages and contusions. The calvarium is removed and the dura is examined. In cases of subdural or subarachnoid hemorrhage, the dura may appear darkened and/or tense. Following careful removal of the dura, the leptomeningeal coverings are exposed. Purulent inflammation (see the following image) or frank pus should be cultured; a cisternal tap can also be used at this point to help decrease the risk of contamination. If subarachnoid hemorrhage is present, a diligent search for ruptured saccular (Berry) aneurysms or arteriovenous (AV) malformations should be undertaken. Purulent meningitis in a 34-year-old man with acute bacterial pyarthrosis due to Streptococcus pneumoniae. Other forms of spontaneous intracranial hemorrhage, including subdural and intraparenchymal hemorrhage are most likely due to hypertension although other causes of sudden death, such as epilepsy/seizure disorders, multiple sclerosis, primary CNS tumors, or Chiari malformation, are occasionally seen. Sudden death can also be seen with neurodegenerative disorders. In order to best evaluate the brain for subtle lesions, fixation in formalin is recommended. Consultation with a neuropathologist is also recommended, if available. Acute hemorrhage is seen in numerous conditions include bleeding from esophageal varices, Mallory-Weiss tears of the esophagus, peptic ulcers, arteriovenous malformations, aortoenteric fistulas, and ruptured aneurysms. Hepatic cirrhosis and steatosis are also recognized causes of sudden death; cirrhotic livers appear hard, shrunken, and nodular; fatty livers may have a tan-yellow, homogeneous appearance with a "slippery" texture. In this section, evisceration techniques, dissection of the cardiac conduction system, and dissection in cases of suspected pulmonary embolism (PE) and deep vein thrombosis (DVT), pneumothorax, and gastroesophageal varices are briefly reviewed. Four main evisceration techniques are used during routine autopsy practice, depending on the goals of the autopsy and preferences of the prosector: Virchow, Rokitansky, en bloc, or en mass techniques. The technical aspects of these techniques have been published elsewhere and will not be discussed in this section. [13, 15] For cases of natural deaths in which specific organ relationships and/or preservation of vascular structures is warranted, use of the en bloc or en mass technique may be useful, particularly if an autopsy assistant is performing the evisceration. Of note, regardless of the method of evisceration used, the prosector responsible for the autopsy should pay particular attention to the position of the bowel in situ so as not to miss cases of volvulus or herniation/incarceration. In all cases of sudden death, the pulmonary arteries should be examined in situ for the presence of thromboemboli, because removal of the organs or organ block may dislodge the emboli or otherwise obscure its true significance. This can be accomplished by incising the pulmonary artery and gently inserting a finger to feel for obstruction at the bifurcation or on either side. Further dissection of the pulmonary arteries can be made down to the hilum if necessary. In cases where thromboemboli are present or suspected, the deep veins of the leg and pelvis should be examined. This is most easily accomplished following evisceration and examination of the abdominopelvic and thoracic cavities. Appropriate personal protective equipment (PPE) should be worn in all cases, including gown, gloves (preferably with a cut-resistant underglove), mask, eye protection, and surgical cap. An N-95 or N-100 mask can be worn if tuberculosis is suspected. See also Universal Precautions and High-Risk Autopsies. Select histologic findings in common cardiovascular and pulmonary causes of sudden death are reviewed in this section. Cardiomyopathies and myocardial infarction are common cardiovascular causes of sudden death. This photomicrograph demonstrates hypertrophic cardiomyopathy. In dilated cardiomyopathy, there is nonspecific myocyte hypertrophy and interstitial fibrosis. Acute myocardial infarction with early granulation tissue and neovascularization. Acute myocardial infarction with extensive coagulative necrosis. No specific photographs or documentation is necessary beyond those that are standard for routine autopsies, including an identification (ID) photograph, external body diagram, and autopsy report. Overall body photographs and photographs of pertinent positive and negative findings are not required; however, they may prove to be helpful, particularly if the diagnosis is challenged in the future. Although probably good practice in all cases, photographic documentation may be particularly relevant in cases of natural death in custody and in cases of sudden, unexplained deaths in infants and children. Specimens are routinely collected for toxicology in all medical examiner cases. Routine specimens should include both central (aortic) and peripheral (femoral) blood samples, vitreous, brain, and liver. Blood should be collected in tubes with sodium fluoride; all specimens should be kept refrigerated until use; then, they can be frozen. In decomposed bodies, the decomposition fluid can be collected from the thoracic cavity. In addition to the standard specimens, bile and gastric contents may be helpful. These nonroutine specimens can be collected and refrigerated or frozen until needed. If inhalation of volatile substances is a possibility, lung tissue can be collected in special bottles for head-space analysis. The utility of postmortem microbiology has been debated, due to frequent contamination of postmortem cultures, use of antibiotics, and lack of agreement between antemortem and postmortem cultures. Even with a high rate of culture contamination and postmortem bacterial overgrowth, carefully selected specimens can provide important information, particularly if a known pathogenic organism is isolated in pure culture from a sterile site or from tissue that looks grossly infected. A number of specimens can be sent for microbiologic analysis. Blood, cerebrospinal fluid (CSF), spleen, brain, pericardial fluid, and pleural effusions, as well as grossly infected tissue from any site are frequently examined for bacterial, fungal, and acid fast organisms. A Gram stain of touch preps or smears of the suspicious tissue or body fluid can help direct the best course of action. Isolation of viruses can be accomplished by several methods including direct detection (immunofluorescence [IF], enzyme immunoassay [EIA], or polymerase chain reaction [PCR]), viral culture, and serology. Most postmortem viral cultures can be collected in viral transport media (VTM) and stored at 4-8° C. CSF and stool should not be put in VTM. If testing for cytomegalovirus (CMV) and respiratory syncytial virus (RSV) is necessary, samples should not be refrigerated. As much as is possible, sterile techniques should be used to collect microbiologic specimens. Common methods include cleaning the skin with iodine before needle stick or searing the surface of an organ from where the sample will be taken. Sterile needles, blades, swabs, syringes, and containers should be used. Saving material to use for future studies can be done using touch preps and air-dried smears, use of special fixatives (glutaraldehyde) for electron microscopy, and flash freezing fresh tissue. Body fluid specimen testing may include bacterial, fungal, acid-fast bacilli (AFB), and viral studies. Tissue specimen testing may include may include bacterial, fungal, acid-fast bacilli (AFB), viral, and blood culture studies. When collecting tissue for bacterial, fungal, and AFB studies, tissue samples measuring 1-2 cm3 should be sent in a sterile container without fixative. Specimens that are too small may dry out and may not be useful. Specimens that are too large are difficult for the microbiology laboratory to process. Tissue can be frozen for future use. When collecting tissue for viral studies, the tissue sample should be at least 5 mm3 and is transported in VTM. For bacterial blood cultures, aerobic and anaerobic blood culture bottles should be immediately inoculated with 5-10 mL of blood. For viral blood cultures, collect blood in a tube with an anticoagulant, and transport to the laboratory within 2 hours. Do not refrigerate if CMV is suspected. In certain cases, it may be necessary to collect material for cytogenetic analysis. Samples should be collected in sterile fashion and submitted to the laboratory within 1-2 days. Avoid exposure to extreme temperatures. Blood and bone marrow should be anticoagulated with sodium heparin. Fascia lata (for fibroblast culture) should be wrapped in sterile gauze moistened with Hanks balanced salt solution (HBSS). Solid tumors can be submitted in HBSS. If no fresh tissue is available, some cases may still be amenable to fluorescent in situ hybridization (FISH) on formalin-fixed, paraffin-embedded tissue. Many of the same biochemical tests that are performed on living individuals can also be performed postmortem; however, there is typically a lack of standardized reference values for postmortem samples, making interpretation of the results more difficult. Typically, reference ranges are calibrated based on blood, serum, or urine from living patients, and their applicability to postmortem samples may be limited. Another limiting factor is the postmortem stability of the analyte as well as the effects of hemoconcentration and postmortem redistribution. Various types of body fluids may be used for postmortem biochemical testing (blood, urine, CSF, joint fluid, vitreous humor); however, vitreous humor is typically the most useful for routine analyses. Compared with blood and other body fluids, vitreous humor is relatively more stable, well-protected from contamination or passive diffusion, and is easily collected. A panel of biochemical tests, essentially equivalent to a basic metabolic panel in living patients, is routinely performed on postmortem vitreous samples. The panel includes vitreous sodium, potassium, chloride, urea nitrogen, creatinine, and glucose. Reference ranges have been established for these tests and quantitative results and overall patterns can be of diagnostic significance (see Table 1, below). VUN = urea nitrogen concentration in vitreous humor. See also Adjuncts to the Forensic Autopsy, Forensic Toxicology - Drugs and Chemicals, Postmortem Vitreous Analyses. Christiansen LR, Collins KA. Natural death in the forensic setting: a study and approach to the autopsy. Am J Forensic Med Pathol. 2007 Mar. 28(1):20-3. [Medline]. Centers for Disease Control and Prevention. Injury prevention & control: data & statistics (WISQARS) (2010). Available at http://www.cdc.gov/injury/wisqars/index.html. Accessed: September 26, 2011. Froede RC, ed. Handbook of Forensic Pathology. 2nd ed. Northfield, Ill: College of American Pathologists; 2003. World Health Organization. International statistical classification of diseases and related health problems, 10th revision (2007). Available at http://apps.who.int/classifications/apps/icd/icd10online/. Accessed: September 26, 2011. Centers for Disease Control and Prevention. Sudden unexpected infant death and sudden infant death syndrome (2010). Available at http://www.cdc.gov/SIDS/. Accessed: September 26, 2011. Peterson GF, Clark SC, and the National Association of Medical Examiners. Forensic autopsy performance standards. Am J Forensic Med Pathol. 2006 Sep. 27(3):200-25. [Medline]. Langlois NE. Sudden adult death. Forensic Sci Med Pathol. 2009. 5(3):210-32. [Medline]. Chugh SS, Reinier K, Teodorescu C, et al. Epidemiology of sudden cardiac death: clinical and research implications. Prog Cardiovasc Dis. 2008 Nov-Dec. 51(3):213-28. [Medline]. [Full Text]. Maron BJ, Towbin JA, Thiene G, et al. Contemporary definitions and classification of the cardiomyopathies: an American Heart Association Scientific Statement from the Council on Clinical Cardiology, Heart Failure and Transplantation Committee; Quality of Care and Outcomes Research and Functional Genomics and Translational Biology Interdisciplinary Working Groups; and Council on Epidemiology and Prevention. Circulation. 2006 Apr 11. 113(14):1807-16. [Medline]. Hugar BS, Harish S, Girishchandra Y, Jayanth S. Study of sudden gastrointestinal deaths: An autopsy study. Med Sci Law. 2013 Jul 10. [Medline]. Darke S, Duflou J, Torok M, Prolov T. Characteristics, circumstances and toxicology of sudden or unnatural deaths involving very high-range alcohol concentrations. Addiction. 2013 Aug. 108(8):1411-7. [Medline]. Pilgrim JL, Woodford N, Drummer OH. Cocaine in sudden and unexpected death: a review of 49 post-mortem cases. Forensic Sci Int. 2013 Apr 10. 227(1-3):52-9. [Medline]. Waters BL, Ludwig J, eds. Handbook of Autopsy Practice. 4th ed. Totowa, NJ: Humana Press Inc; 2009. Kumar V, Abbas AK, Fausto N, Aster J. Robbins and Cotran Pathologic Basis of Disease. 8th ed. Philadelphia, Pa: Saunders/Elsevier; 2010. Gulino SP. Examination of the cardiac conduction system: forensic application in cases of sudden cardiac death. Am J Forensic Med Pathol. 2003 Sep. 24(3):227-38. [Medline]. Hugar BS, Shetty H, Girishchandra YP, Hosahally JS. Sudden neuropathological deaths: An autopsy study. Med Sci Law. 2015 Jul. 55 (3):223-7. [Medline]. Hugar BS, Harish S, Girishchandra YP, Jayanth SH. Study of sudden gastrointestinal deaths: an autopsy study. Med Sci Law. 2014 Apr. 54 (2):63-7. [Medline]. Dolinak D, Matshes EW, Lew EO, eds. Forensic Pathology: Principles and Practice. Amsterdam, The Netherlands: Elsevier Academic Press; 2005. Burton JL. Health and safety at necropsy. J Clin Pathol. 2003 Apr. 56(4):254-60. [Medline]. [Full Text]. [Guideline] World Health Organization. Global alert and response (GAR): WHO infection control guidelines for transmissible spongiform encephalopathies. Report of a WHO consultation, Geneva, Switzerland, 23-26 March 1999. Available at http://www.who.int/csr/resources/publications/bse/WHO_CDS_CSR_APH_2000_3/en/. Accessed: May 9, 2011. Burnett LC, Lunn G, Coico R. Biosafety: guidelines for working with pathogenic and infectious microorganisms. Curr Protoc Microbiol. 2009 May. Chapter 1:Unit 1A.1. [Medline]. Gattuso P, Reddy VB, David O, Spitz DJ, Haber MH, eds. Differential Diagnosis in Surgical Pathology. 2nd ed. Philadelphia, Pa: Saunders/Elsevier; 2010. Wilson SJ, Wilson ML, Reller LB. Diagnostic utility of postmortem blood cultures. Arch Pathol Lab Med. 1993 Oct. 117(10):986-8. [Medline]. Roberts FJ. Procurement, interpretation, and value of postmortem cultures. Eur J Clin Microbiol Infect Dis. 1998 Dec. 17(12):821-7. [Medline]. Morris JA, Harrison LM, Partridge SM. Postmortem bacteriology: a re-evaluation. J Clin Pathol. 2006 Jan. 59(1):1-9. [Medline]. [Full Text]. Hove M, Pencil SD. Effect of postmortem sampling technique on the clinical significance of autopsy blood cultures. Hum Pathol. 1998 Feb. 29(2):137-9. [Medline]. Rose KL, Collins KA. Vitreous postmortem chemical analysis. NewsPath. College of American Pathologists. December 1, 2008. [Full Text]. Ackerman MJ. State of postmortem genetic testing known as the cardiac channel molecular autopsy in the forensic evaluation of unexplained sudden cardiac death in the young. Pacing Clin Electrophysiol. 2009 Jul. 32 suppl 2:S86-9. [Medline]. Behr ER, Dalageorgou C, Christiansen M, et al. Sudden arrhythmic death syndrome: familial evaluation identifies inheritable heart disease in the majority of families. Eur Heart J. 2008 Jul. 29(13):1670-80. [Medline]. Biggs MJ, Brown LJ, Rutty GN. Can cause of death be predicted from the pre-necropsy information provided in coroners' cases?. J Clin Pathol. 2008 Jan. 61(1):124-6. [Medline]. Byard RW. A review of the potential forensic significance of traditional herbal medicines. J Forensic Sci. 2010 Jan. 55(1):89-92. [Medline]. Carturan E, Tester DJ, Brost BC, Basso C, Thiene G, Ackerman MJ. Postmortem genetic testing for conventional autopsy-negative sudden unexplained death: an evaluation of different DNA extraction protocols and the feasibility of mutational analysis from archival paraffin-embedded heart tissue. Am J Clin Pathol. 2008 Mar. 129(3):391-7. [Medline]. Centers for Disease Control and Prevention. Healthy weight - it's not a diet, it's a lifestyle! Body mass index. Available at http://www.cdc.gov/healthyweight/assessing/bmi/index.html. Accessed: September 26, 2011.
de la Grandmaison GL, Charlier P, Durigon M. Usefulness of systematic histological examination in routine forensic autopsy. J Forensic Sci. 2010 Jan. 55(1):85-8. [Medline]. Del Rosario ME, Weachter R, Flaker GC. Drug-induced QT prolongation and sudden death. Mo Med. 2010 Jan-Feb. 107(1):53-8. [Medline]. Fabre A, Sheppard MN. Sudden adult death syndrome and other non-ischaemic causes of sudden cardiac death. Heart. 2006 Mar. 92(3):316-20. [Medline]. [Full Text]. Furness PN. Death certification. Investigation of death is set to improve at last. BMJ. 2009 Apr 21. 338:b1609. [Medline]. Hanzlick R. Medical examiners, coroners, and public health: a review and update. Arch Pathol Lab Med. 2006 Sep. 130(9):1274-82. [Medline]. Hunter RL, Jagannath C, Actor JK. Pathology of postprimary tuberculosis in humans and mice: contradiction of long-held beliefs. Tuberculosis (Edinb). 2007 Jul. 87(4):267-78. [Medline]. Johnson JN, Tester DJ, Bass NE, Ackerman MJ. Cardiac channel molecular autopsy for sudden unexpected death in epilepsy. J Child Neurol. 2010 Jul. 25(7):916-21. [Medline]. Love S. Post mortem sampling of the brain and other tissues in neurodegenerative disease. Histopathology. 2004 Apr. 44(4):309-17. [Medline]. Mackey-Bojack SM, Roe SJ, Titus JL. Sudden death with circumferential subepicardial fibrofatty replacement: left-sided arrhythmogenic ventricular cardiomyopathy. Am J Forensic Med Pathol. 2009 Jun. 30(2):209-14. [Medline]. Madea B, Musshoff F. Postmortem biochemistry. Forensic Sci Int. 2007 Jan 17. 165(2-3):165-71. [Medline]. Mash DC, Duque L, Pablo J, et al. Brain biomarkers for identifying excited delirium as a cause of sudden death. Forensic Sci Int. 2009 Sep 10. 190(1-3):e13-9. [Medline]. Naghavi M, Makela S, Foreman K, O'Brien J, Pourmalek F, Lozano R. Algorithms for enhancing public health utility of national causes-of-death data. Popul Health Metr. 2010 May 10. 8:9. [Medline]. [Full Text]. Nolte KD, Hanzlick RL, Payne DC, et al. Medical examiners, coroners, and biologic terrorism: a guidebook for surveillance and case management. MMWR Recomm Rep. 2004 Jun 11. 53:1-27. [Medline]. Spitz WU, Spitz DJ, Fisher RS, eds. Spitz and Fisher''s Medicolegal Investigation of Death: Guidelines for the Application of Pathology to Crime Investigation. 4th ed. Springfield, Ill: Charles C. Thomas Publisher; 2006. Tu E, Bagnall RD, Duflou J, Lynch M, Twigg SM, Semsarian C. Post-mortem pathologic and genetic studies in "dead in bed syndrome" cases in type 1 diabetes mellitus. Hum Pathol. 2010 Mar. 41(3):392-400. [Medline]. Verheugt CL, Uiterwaal CS, van der Velde ET, et al. Mortality in adult congenital heart disease. Eur Heart J. 2010 May. 31(10):1220-9. [Medline]. Wilhelm M, Bolliger SA, Bartsch C, Fokstuen S, Gräni C, Martos V, et al. Sudden cardiac death in forensic medicine – Swiss recommendations for a multidisciplinary approach. Swiss Med Wkly. 2015. 145:w14129. [Medline]. Isolated left ventricular myocardial noncompaction. The heart is enlarged (530 g) with biventricular dilatation and subendocardial trabeculation that is near transmural in areas. The decedent was a 32-year-old man found down on the side of the road. This photograph demonstrates extensive fatty replacement of the right ventricular wall in arrhythmogenic right ventricular dysplasia (ARVD). The decedent was a previously healthy 35-year-old woman who had a witnessed collapse while walking. Multifocal, lipomatous infiltration of the left ventricle with cardiomegaly (600 g) and left ventricular hypertrophy, consistent with arrhythmogenic left ventricular dysplasia (ALVD). The decedent, a 44-year-old woman with a history of asthma, had been swimming in a cold lake. She reportedly came out of the water complaining of "not feeling well." She used her albuterol inhaler; then, within a short time period, she became unresponsive and went into cardiac arrest. Nodular tan-white infiltrates are seen throughout the myocardium a case of systemic sarcoidosis. The decedent had complained of not feeling well several days before his death, but he had had no specific symptoms and had not sought medical attention. The presence of randomly distributed, scarlike nodules involving both ventricles and papillary muscles but which do not appear to be associated with a specific vascular territory or with coronary atherosclerosis favors a diagnosis of sarcoidosis over that of healed myocardial infarcts. 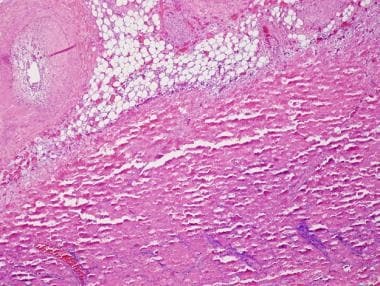 Multiple, noncaseating granulomas within the myocardium and epicardial fat in systemic sarcoidosis. High-power photomicrograph of a noncaseating granuloma in systemic sarcoidosis. Systemic sarcoidosis. 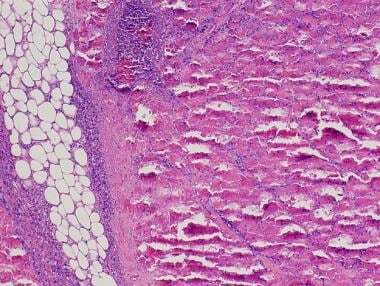 Well-defined, noncaseating granulomas are seen within the lung parenchyma, which is otherwise normal. Cardiomegaly (80 g) with left ventricular fibrosis in a 9-month-old male infant who had been seen by his pediatrician the day before for an upper respiratory infection. He was taken to the emergency department the day of his death for difficulty breathing. While playing in the waiting room, he suddenly stiffened, arched his back, and went into cardiac arrest. Photomicrograph of the left ventricular wall showing a large, geographic area of fibrosis and inflammation in a case of active lymphohistiocytic myocarditis. This photomicrograph shows dense, mixed inflammation of the myocardium in lymphohistiocytic myocarditis. Higher-power view of the previous image, showing dense, chronic inflammation with destruction of the myocytes. Congenital supracristal ventricular septal defect in a 21-year-old patient with Eisenmenger complex. The decedent was found dead in his bed by his stepfather. Hemopericardium in sudden death due to aortic dissection. This is an in situ photograph demonstrating a type A aortic dissection. This photograph illustrates a type A aortic dissection with concomitant dissection of the pulmonary artery. A magnified view of the type A aortic dissection with concomitant dissection of the pulmonary artery from the previous image. Arteriolonephrosclerosis in a case of long-standing hypertensive cardiovascular disease. This is a postmortem indirect ophthalmoscopic image showing 2 fundal hemorrhages (Roth spots) in a case of acute bacterial endocarditis. Coronary artery dissection seen in a case of sudden death in a young woman. Higher power view of the previous image showing the acute dissection of an epicardial artery with focal eosinophilic inflammation. Photomicrograph of an aortic root aneurysm in a patient with Marfan syndrome (same patient as in the previous image). There is obvious fragmentation of the media with myxoid degeneration. Photomicrograph of an aortic root aneurysm in a patient with Marfan syndrome (same patient as in the previous image). Fragmentation of the media is highlighted by the Verhoeff-Van Gieson (EVG) elastic stain. This in situ photograph shows significant cardiomegaly in a 5-month-old infant with endocardial fibroelastosis. 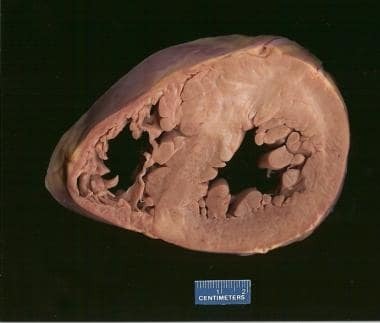 A cross-section of the heart from the previous image in a 5-month-old with endocardial fibroelastosis. 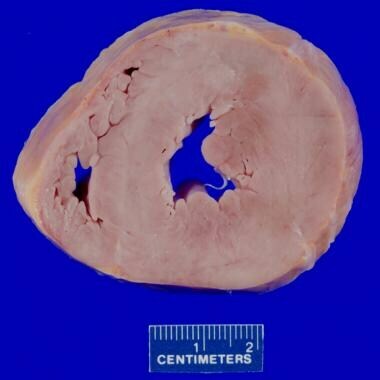 This photograph demonstrates thickening and fibrosis of the subendocardium. 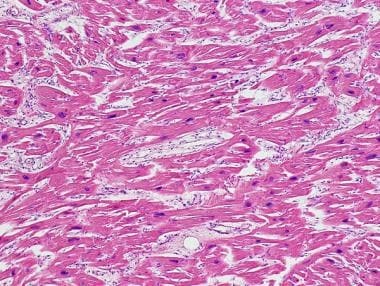 This photomicrograph shows fibrosis of the endocardium from the heart of a 5-month-old infant who died from endocardial fibroelastosis (same patient as in the previous image). Verhoeff-Van Gieson (EVG) elastic stain showing fibrosis and elastosis of the endocardium in endocardial fibroelastosis (same patient as in the previous image). This photograph depicts a bowel infarct. Hemorrhagic mucosa in a case of bowel infarct due to mesenteric ischemia. Acute necrotizing pyelonephritis due to Klebsiella oxytoca and Escherichia coli. The decedent was a 31-year-old woman with a history of idiopathic thrombocytopenic purpura and previous splenectomy. She presented to the emergency department complaining of nausea, vomiting, and abdominal pain, where she underwent cardiac arrest. This photomicrograph shows a section of kidney from a previously healthy, middle-aged man found dead at home. 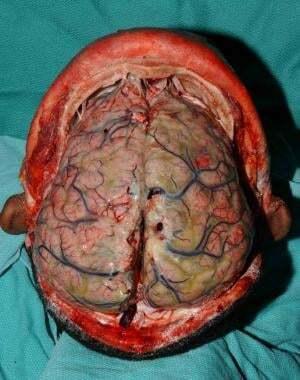 Atrophy of the cerebellar vermis in a patient with chronic alcoholism.